On the few occasions that I have walked past Grimaldi's, steps away from the Brooklyn Bridge in DUMBO, I have always been puzzled and slightly put off by the line of people snaking down the block to get inside. 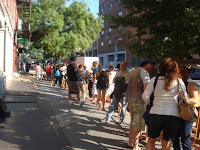 But in my experience, there is only one thing that New Yorkers are willing to patiently wait in line for and that's great food: Grimaldi's pizzas are widely recognized to be amongst the best ones in town. It is is also one of the few remaining vestiges of a New York of an earlier era - they don't take reservations, do not deliver and never sell pizza by the slice. It is therefore with some trepidation that my friends and I joined the queue late one Sunday afternoon and we were not disappointed. Entering the restaurant is a little like stepping back in time as the decor doesn't seem to have changed much since it opened. You can easily imagine how it would have been a meeting place for local Italian American families but these days they are very likely to have been pushed out of the now trendy area by rising property prices and the clientele is very mixed. One side of the room is adorned with black and white pictures of Frank Sinatra (including a mug shot from a police arrest) while the other boasts a myriad of pictures of celebrities and notaries who have graced the establishment with their presence. The wood burning oven takes center stage at the back of the room and watching the flurry of activities, including some pizza dough throwing of course, is fascinating. We opted for a simple pie - tomato, pepperoni, mozarella and basil - which came on a perfectly thin and deliciously chewy crust. Washed down with a cold and crisp bottle of Pinot Grigio, it was simply heaven. Slightly dazed and confused from the carbohydrate overdose, we left the restaurant and walked across the bridge to get back to Manhattan, stopping every few minutes to take in the breathtaking scenery and wonderfully pink sunset over the City skyline. The perfect conclusion to a perfect meal.